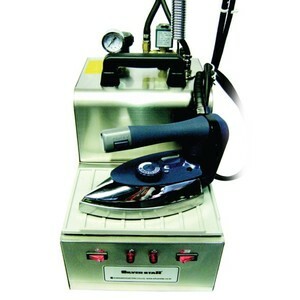 At just 3.5 lbs., this powerful and comfortable iron emits the best quality steam in the industry. Specially treated urethane Rubber Handle keeps hands cool and prevents slipping. Safety valve in cap discharges pressure if other safeguards fail. Two automatic thermostats prevent overheating. Internal fuse disconnects electricity if thermostats fail. If there is no water in the boiler, the power switch will turn off automatically and the LED indicator will light up. Automatic pressure switch prevents excessive pressure. We purchased 2 irons about 9 months ago & one needed to be replaced. I would expect product to last at least a few years before replacing.